and a promo gift and which will be used for a long time. Print your logo onto these custom printed silver millennium stoneware coffee mugs or one of our other innovative ceramic mugs and use them in your next marketing campaign as a unique giveaway item. These custom printed cups are made for special events! They come with a capacity of 330ml as well as a D handle and feature an unique matt silver outer coating which produces a metallic effect when branded. A dishwasher safe full colour wrap around branding will be applied and the finished products will be supplied in a nice black gift box. Custom brand these ceramic mugs with sleeves (300ml) or one of our best-selling promotional cups & mugs»ceramic mugs with your company logo! 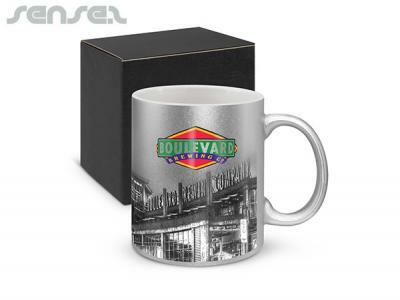 Personalise your silver millennium stoneware coffee mugs or custom design ceramic mugs for your marketing campaign. How can these unique promotional silver millennium stoneware coffee mugs or our personalised ceramic mugs fit in with your marketing strategy and help you maximise your brand exposure? Our custom made Silver Millennium Stoneware Coffee Mugs can be produced from a minimum quantity of 50 pieces. We can have your logo branded on these corporate Silver Millennium Stoneware Coffee Mugs in Full Colour Digital Print. A setup fee of AU$180.00 will apply to make the film.